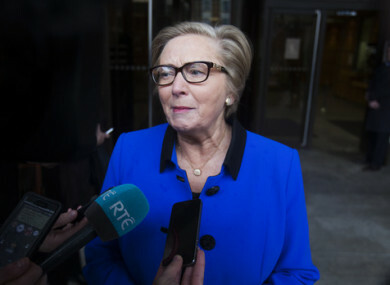 TAOISEACH LEO VARADKAR is expected to come under pressure from the opposition at Leaders’ Questions in the Dáil later, in the wake of the emergence of new details about when Frances Fitzgerald first learned about the legal strategy to attack the credibility of whistleblower Sergeant Maurice McCabe during the O’Higgins Commission. RTÉ reported last night that the Taoiseach’s account of when Fitzgerald (who was Justice Minister during the Commission of Investigation) first learned about the strategy had been corrected by the Department of Justice. McCabe was vindicated by that probe last year on issues he’d raised about garda misconduct, but the government is now under pressure to disclose what it knew about plans to discredit him at that commission. About to go on @ClaireByrneLive with new info on what the Tanaiste knew about the strategy to attack Maurice McCabe at the O'Higgins Commission - and when did she know it. Mary Lou McDonald (SF): What kind of answer is that? Leo Varadkar: I cannot give the House that answer but what I have been told is that the Department was not made aware of it until after the fact and the Tánaiste did not become aware of it until around the time it entered the public domain. I am answering Deputy Howlin’s question as best I can. It is very difficult to answer questions for third parties or unnamed parties. …made aware in general terms in May 2015 of an issue having been raised by Counsel for Sergeant McCabe following the exchanges at the commission hearings and the then-minister was informed at that time in the context of it being a matter for the gardaí. As the Taoiseach has stated, the then minister did not become aware of the full details of the issue until the matter became public. The same is true in respect of the department’s knowledge. This latest statement confirms that Fitzgerald, who’s now the Minister for Business and Enterprise, was informed about a row over the strategy at the Commission of Investigation a year before the matter was made public in May of 2016. Labour TD Alan Kelly has submitted a series of detailed parliamentary questions to the Department of Justice related to the O’Higgins Commission in recent weeks. Speaking on Morning Ireland today, Kelly said the government had been trying to shut him down on the issue. He said the statement from the department represented a “complete contradiction” of what the Taoiseach told the Dáil last week. “We need full details of what went on,” Kelly said. The Taoiseach needed to address the Dáil today to explain “how in the name of God” he could have got it so wrong in his statement last week. He said the position of the Tánaiste was now “precarious” and that he would continue to ask questions on the issue. “It’s a very precarious situation for the government in general,” Kelly said. Speaking on the same programme, Simon Coveney, the Foreign Affairs Minister, said there was “no attempt by the Government here to hide anything”. He said the issues were now being examined by the Disclosures Tribunal and insisted that Fitzgerald had a strong record protecting whistleblowers and encouraging them to come forward. He said the Taoiseach would answer any questions people had on the issue in the Dáil this week and that he disagreed with Kelly’s assessment that the Tánaiste’s position was precarious. Email “'How in the name of God did this happen? ': Government under fresh pressure over McCabe timeline ”. Feedback on “'How in the name of God did this happen? ': Government under fresh pressure over McCabe timeline ”.